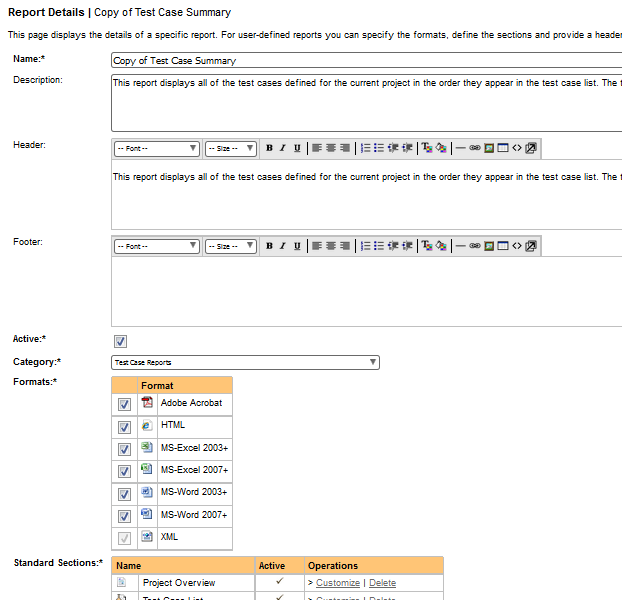 For this example we shall be modifying the second Standard Section of the Test Case Summary Report. We will be removing a couple of columns that we don't need and adding a new calculated column instead. Name - this is the name of the standard section you want to use in the report. You can choose a different standard section, but you cannot edit the name itself. Description - this is the description of what the section is designed to do, this is read only and changes if you select a different section name from the dropdown above. Template - This contains the eXtensible StyLesheet Template (XSLT) that is used to transform the raw data coming from Spira into the desired presentation format. XSLT includes both HTML elements (e.g. a list or table) plus XSLT specific tags that select the data from Spira and present it in some way. 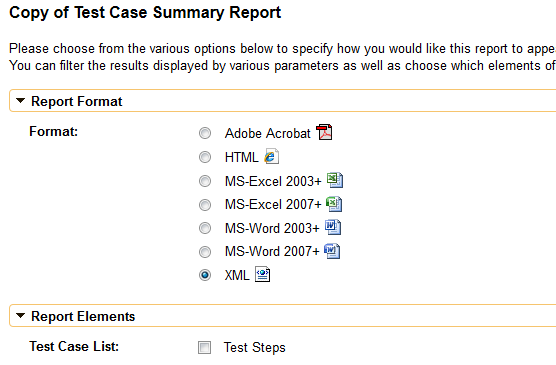 This is used to generate the dynamic portion of the report section. We shall discuss this next. Feel free to edit the Header and Footer to make your section more readable, for example include a section heading or some introductory text. 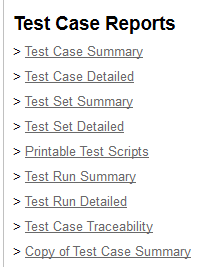 You might want to add a horizontal line (<HR>) to the footer to mark the end the report section. So before we can successfully modify the report, we need to understand what data is being returned by Spira. This fragment of the report lets you see all of the data that is available for displaying in your report. You can navigate this hierarchy of information using the special XSLT selection language called XPATH. This lets you query the data returned from Spira to retrieve specific data elements that can be displayed in the report. Before we start modifying the report XSLT to use this data, we first need to get a basic understanding of XPATH itself. 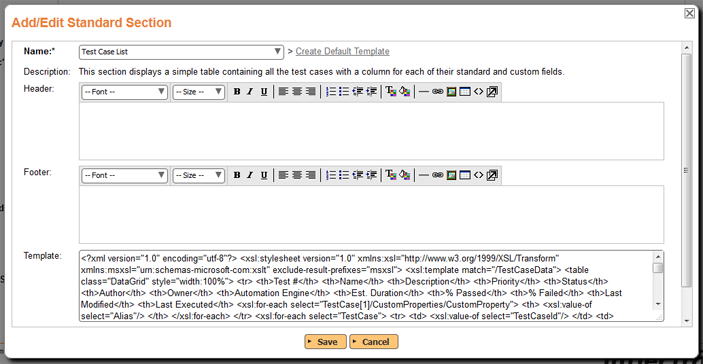 XPath is used to navigate through elements and attributes in an XML document. XPath uses path expressions to select nodes or node-sets in an XML document. These path expressions look very much like the expressions you see when you work with a traditional computer file system. element node - <book>, <title>, <author>, etc. Predicates are used to find a specific node or a node that contains a specific value. Predicates are always embedded in square brackets. Now that we understand the basics of XPath we can use that knowledge to modify our XSLT template to change the data that is included in our report. This removes the four columns related to test steps. Note: the mathematical operators for XPATH are: + (add), * (multiply), - (subtract) and div (division). The slash is not used for division because it is already used as a node path separator. Now we have learned how to modify one of the standard reports and use XSLT, XPATH and a 'standard section' to reformat how the data appears. You can use your knowledge of XPATH and XSLT to make more sophisticated changes. For example you could delete the entire XSLT default template and create a new template that displays a simple list of test cases, or a table of just test case names and IDs. In the third and ﻿final ﻿installment of this series we will be looking at how to create 'custom sections' in the report to perform more customized querying and reporting of the data.